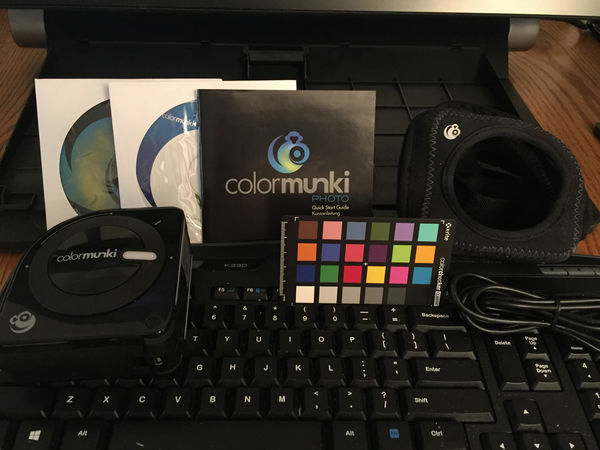 This Xrite ColorMunki Photo will precisely calibrate your monitor and printer for accurate color reproduction and provide you with profiles for any type of paper you are using. Included with this kit are the software CD, a setup CD for the hardware and software, an installation guide book, the Color Checker Classic color target, USB connector, the Xrite ColorMunki Photo monitor and print profiler and the profiler pouch.The easy step by step graphical workflow program will have you profiling your monitor and printer in no time at all. I can ship anywhere in the Continental US for $15.00 and I accept PayPal.